1. To continue to build on the success of our effective communications network which has helped us to breaks down barriers and crosses borders. Antonio Fritz, the ITF Regional Secretary for Latin America brought the experience of Latin American unions to the Arab World Conference. He pointed out the similar situation of workers in his region: the arrest and detention and even murder of trade union leaders; the setting up of yellow unions by governments; the fight against privatisation. He explained some of the functions of a national coordination committee. The key role was to bring transport unions together at the national level to coordinate together. This gives transport unions a greater voice. He gave examples of other roles should be to bring genuine unions into coordination which are not affiliated to the ITF. These committees might also tackle the issue of organising informal workers in transport. There should be activities for women and youth. They should help unions with sharing information. The NCCs could often create unity between transport unions who are divided from each other because of belonging to different national union centres. The ultimate responsibility, however, is to ensure that every single transport worker is represented by a trade union. Bilal Malkawi proposed that the region needed to identify countries where a National Coordinating Committee would be a real benefit. A representative from Morocco related the benefits they had experienced from coordinating between transport unions in their country. They had set up an NCC and it had strengthened the union voice in the country. Other delegates said they would go away and set up such national coordination which they were convinced would help them. Haitam Ellweze informed the conference about the active communications network being developed between young transport workers in the region. They had already used these networks to pressure governments and employers violating the rights of workers. Young workers had been a driving force in political change in the region and they had a great unity among them. Defending union rights was a key priority in the region, including supporting the reinstatement of dismissed workers in Bahrain. There must be a campaign to support young workers, including migrant workers who have no union rights in the Gulf States. The Arab World Womens conference has called for a campaign against violence against women. Such violence reflects a lack of respect for the basic rights of women. Kaltoum Barkallah, chair of the Arab World Women's Committee also told the Conference of the need to strengthen the position of women transport workers as union activists with a particular focus on countries where political change is taking place. They will build an active women transport workers network in the region. A major goal must be more jobs in the transport sector for women. "We also must have affiliates sending women delegates to the ITF Congress in Sophia next year." she said. Union delegates gave reports on the challenges faced in their countries. Berrama Seddeq from the Algerian FNTT which has around 1500 members in air land and sea transport told participants they have only been ITF members in 2006. The union bargains with employers and solve members problems. The union has signed national agreements for land transport and sea transport. These are underpinned by local collective agreements. The union conducts training. Yet the union has difficulties. It has a tiny office and only limited financial resources. The employers do not like dealing with unions in the private sector. Nevertheless they aim to expand in the private sector. We encourage women and young workers to get involved in the union. Ahmed Hassan Sadeq of the Alexandira container terminal trade union in Egypt. The union started up after the revolution. They faced many difficulties. "The old union of the former regime called us traitors. However we got support from the ITF. We were ignorant of our rights. Dr Samar from the ITF told us the lesson was that the best strike was the strike that does not have to happen. In 2012 we got more gains than the year before. However, we were told that the agreement with Hutchinson was null and void. We were threatened with three months in prison. But we fought for our rights. We believe the government should run the ports." Salman Al Saad DHL union in Bahrain told the conference. "Our union is under attack. DHL closed its operation at one point. A new law makes it easier to sack workers. The government has been privatising many companies. We have been asking for there to be protections for employees. Many companies use migrant workers on temporary contracts. We have defended cabin crew laid off in Gulf Air." The unions are fighting for many workers who have been dismissed. Alya Bahrein of the DHL Union related the problem of the government encouraging yellow unions. GeorgeTurkieh of the Lebanese Cabin Crew in Lebanon noted the many difficulties at present in the country. The union was faced with dealing with survival issues. There is no social health care system so the union set up its own fund. They had managed to bargain with the company to improve conditions. He appreciated the ITF office in Amman. Djamenl Lourari of the Algerian General Federation of Port Workers reported the union had around 13,500 workers. Nermin Naji Al Sharif of the Dockers and Seafarers Unionin Libya told the conference that it might be thought that after the revolution the position of dockers would be stronger. But the new government has decided to privatise the ports. "We staged a sit in at the ministry of transport. We told them that we are not alone we have the ITF with us. The government cancelled the decision. But we are afraid of the pressure from foreign investors. We insist that our demands should be considered above those of foreign investors". she said. Jalal Mohammed of the Kurdish Iraq Transport Union informed participants that there was no right to organise in the public sector, although this would change. The union was training workers and organising union committees. Saleh Alwani from Yemen General Transport Workers Union said his union has existed since the 1950s. Union membership increased dramatically after the revolution of the youth. "Now it is time to give the leadership to the youth. However there is no freedom of association in the civil aviation sector. We have strong union committes in the port terminals. DPW is dealing with workers badly, but we forced the government to force the company to improve the situation. There are large numbers of truck and taxi drivers getting organised. The union is getting them insurance. The unions link to civil societ organisations" he said. Mohammed Moteilah of the Jordanian Port Workers Union spoke. The union was organisng workers in the APM terminals.He reported that this powerful company treated its workers very badly. He criticised union leaders who became members of the government. He warned against fake unions being set up by governments. He declared "Our rulers have sold our countries. Our solidarity is our message to repressive governments." Mohamed Haytoum of the UMT in Morocco related how the ITF had given such strong support when Said El Hairech was imprisoned. He noted that the current changes in the region came out of decades of repression and tyrrany. He told how the UGTT offices were opened to the 20th February Movement. "We supported the revolution. There are many goals we are still fighting for, such as getting rid of corruption. We are having to fight privatisation. There are now seven new entrant air carriers in Morocco. The government is trying to fragment the railways. More than 500 bus worker in Fez are on strike against the impact of privatization" he told the conference. He called for strengthened solidarity for union activists under attack. 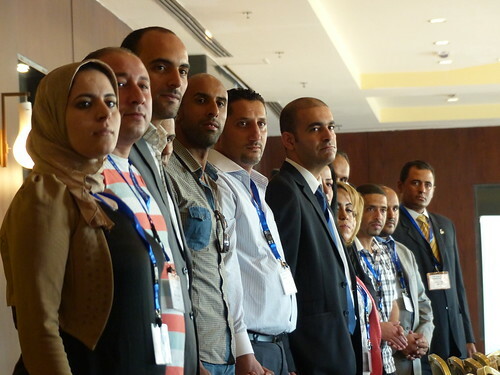 Fadhil Khaleef Al-Marzooq of the Iraqi ports told participants: " We organised many strikes against the previous regime. But after the invasion our actions are labelled a threat to national security. Our country is living a tragedy. But unions are still fighting especially against a new repressive labour law. The occupation forces brought in Maersk. They brought in new workers. The Union rose up. We closed the doors to the port. The workers have stuck with the union. We have the power to halt the port. We have got good pay increases for our members". 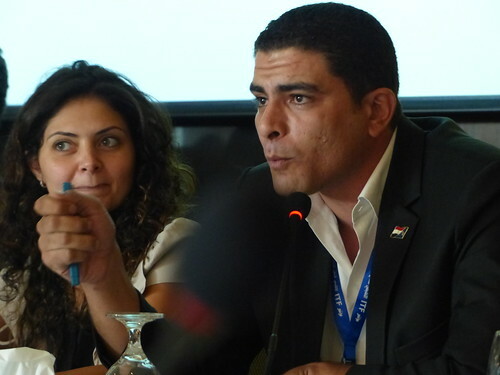 Youssef Ali El Zein from the Middle East Airlines in Lebanon reported that it had become more difficult to hold a dialogue with the company but the union had managed still to improve conditions. AlSharif AlAswad Tunisian Railways told participants that union membership was 80% in the transport sector. The sector is facing privatisation. These pressures actually increased after the revolution. However, the union forced an agreement to stop outsourcing and use of contract workers. He called on the conference to demand justice for the union leader Mukhtar Hili. The union had suffered attacks and was organising a national strike.